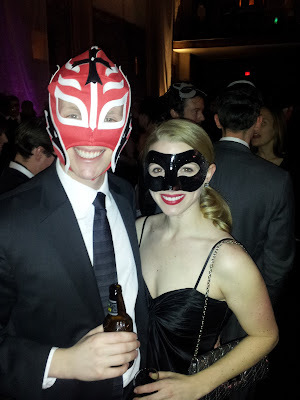 Over the weekend, John and I went to the American Cancer Society's black and white masquerade ball. It was in a beautiful space and had amazing food. It was a great fundraiser, and I wanted to share some pictures and how I made my mask with you! Then, I added layer after layer of glitter spray paint, creating an ombre effect toward the edges. Finally, simply string on some elastic, and you're done! It turned out so cute! You look so pretty too. the mask is beautiful!! well done!! Wow! You look so elegant! Thanks for the mask idea. your mask turned out amazing and you looked wonderful! I wish i read this sooner! I completely failed at making one a couple months ago. Yours is brilliant! Very fun!!! Love what you wore. Looks greT, WELL DONE! Thanks for sharing such a nice post! Also a very large 'thank you' for taking the time to leave a comment for me! Oh I never been to a masquerade before, hope you guys had fun! Your mask is stunning! How fun!! I love the way you made your mask...glitter is always the best. You look so pretty girl! Haha, I love John's mask! I love yours too--and your dress! So pretty!